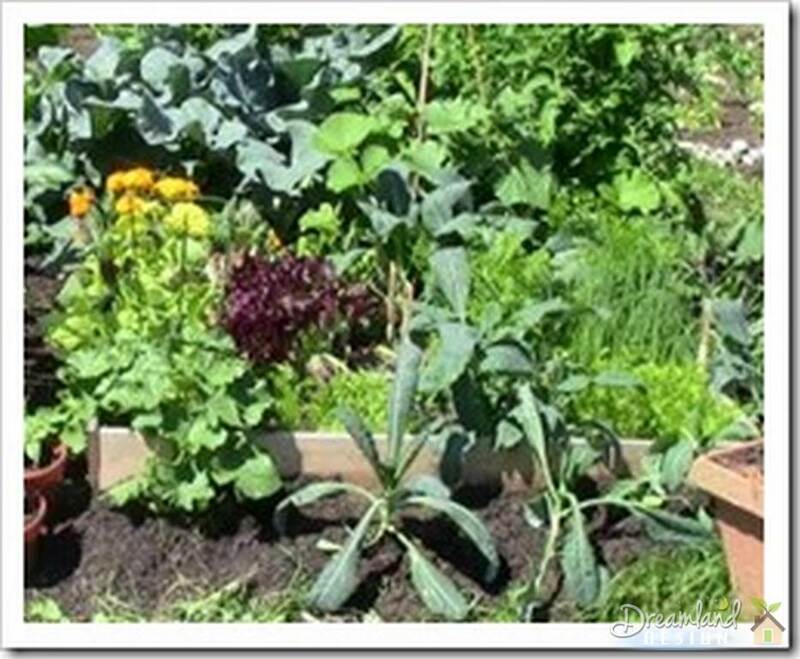 Have you been thinking about growing your own vegetable garden? We thought about having a vegetable garden for health reasons but also it had to save us some money. Since starting our first veggie garden we’ve found we aren’t alone as many people feeling the pinch of increased food prices and current economics are now thinking about going back to the old-fashioned way of doing things by starting vegetable gardening. Heck, even people I know who weren’t the slightest bit interested in plants and organic vegetables are beginning to like the idea of vegetable gardening and it’s mostly due to current economic conditions. For them it’s about saving a buck or two on the grocery bills. Unfortunately, not all people are equipped with knowledge to start their own vegetable garden. For me had to reach back in our memories to about few years ago just to remember what our parents did to grow our vegetables. I remember Dad saying our vegetable garden needed healthy soil for healthy veggies and would put a lot of manure on the soil in the fall and again early spring. I remember this because it didn’t always smell very nice. Besides that he would talk about how much or how little rain we were getting and how it affected our garden and field crops. Dad collected water coming off the roof of our house and sheds into wooden barrels. Then it was the job of my brother and I to carry buckets of water while he would used them to water the garden when it needed it. Looking back I can remember the location of our vegetable garden. There were no trees or buildings to block any sunlight so our garden got direct sunlight all day long. Later I learned that vegetable gardens like to have about 6 to 8 hours of sunlight each day. With that little bit of information we started our first vegetable garden in containers. We used containers to grow tomatoes and strawberries for a few years before we owned a home of our own and started vegetable gardening in the ground although we still use containers to utilize space. If you have a small space in your yard, one of the best vegetable gardening ideas you can adopt is called square foot gardening design. Square foot gardening was created by Mel Bartholomew and caters to those who are looking for ways to grow more out of their very limited gardening space. The image is a 4×4 square foot raised bed garden I found at the YMCA Community Gardens. Below you will find another image that shows what her raised bed square foot garden looked like before it was full of veggies. Square foot gardening allows you to maximize the garden space you have by employing space-saving methods of planting vegetables, such as using raised beds, trellises, and containers/pots. The square foot gardening method works great in raised beds as they can easily be subdivided into square foot sections making a grid to help you plant your vegetables. We used pots for our container garden as each one was about a square foot and still worked a lot like square foot gardening. We built our first raised bed but that’s not for everyone so you should know you can buy “4′x8′ Complete Two Stepper Raised Bed Garden” that will quickly help you get setup for raised bed gardening. The raised bed we built this year was made with wood we had cut to length and just screwed them together. Not bad for our first raised bed. We had to put the screws in by hand which was a lot of work but now we own a power drill that will allow us to build our second raised bed in a quarter of the time it took to do our first. Raised bed gardens can be constructed using a variety of materials such as wood, stone and cinder blocks. We built ours to 10 inches high so that we would have enough soil for strong healthy roots. Plus when we are done we will put a small strip around the top as a border we can sit on to work in the raised bed. No more back pain. However, you have to consider that the width is the most important. Make sure that the bed is wide enough to accommodate two rows of plants, although three rows are better. Square foot gardens that measure 4×4 ft. are surprisingly productive. When using a square foot garden design, Bartholomew recommends that you divide your raised beds into several squares that measure one square foot (hence the name). Just like my friend at the YMCA Community Garden has done it in the image below. 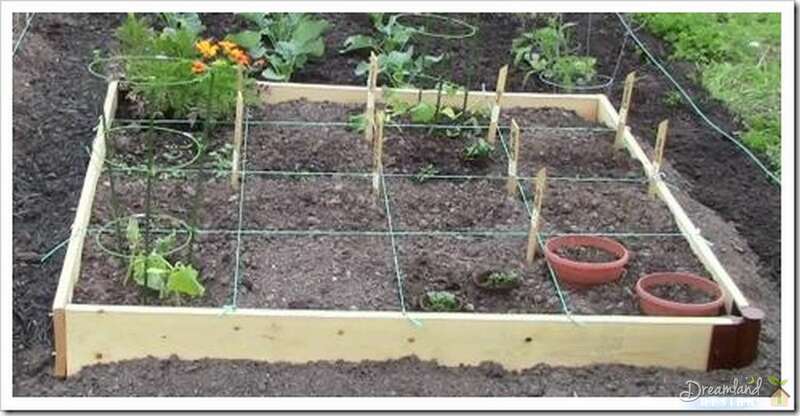 She used string to made a grid of 16 square foot sections for easy planting. Using the 4×4 raised bed allows her to reach to the center from all sides so harvest and weeding is easy. Plus this way of gardening doesn’t leave much space for those weeds to catch hold. On my first attempt at square foot gardening I just used a stick to draw the grid pattern but you can use string, pebbles, sticks or whatever helps you see the grid so you plant properly. Notice the bottom right grid section has two pots right in the ground. This same grid pattern can be used for square foot gardening above ground like me did for years before we owned our property. 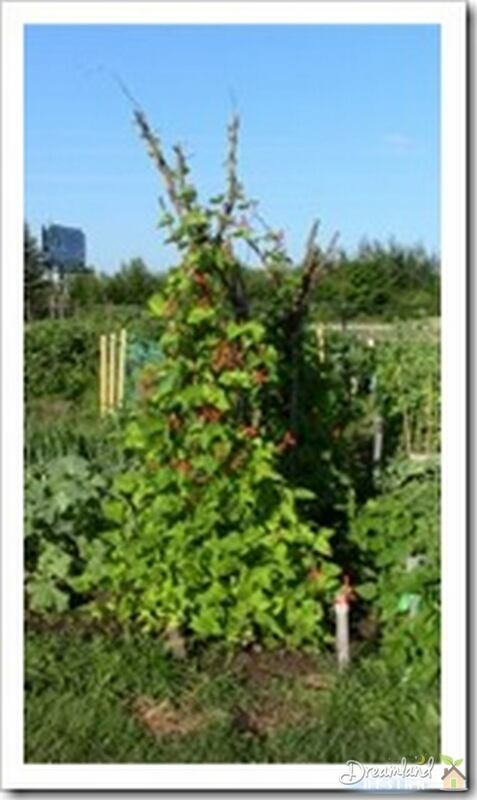 Another vegetable gardening idea one can employ is the use of trellises for vertical gardening. Trellises are a good way to add a third dimension to vegetable gardens with limited spaces. Rather than allowing crops to sprawl across your garden, plants such as watermelon and cucumbers are grown vertically. The image is at the YMCA Community Gardens and is made from broken tree branches, like a T-Pee. Another I saw was smaller but made of bamboo. Another community gardener is using cages we use for tomatoes and some of our tall perennials. They work great to keep them from falling over in the wind. I mentioned we started with container gardening and use a variety of container sizes. 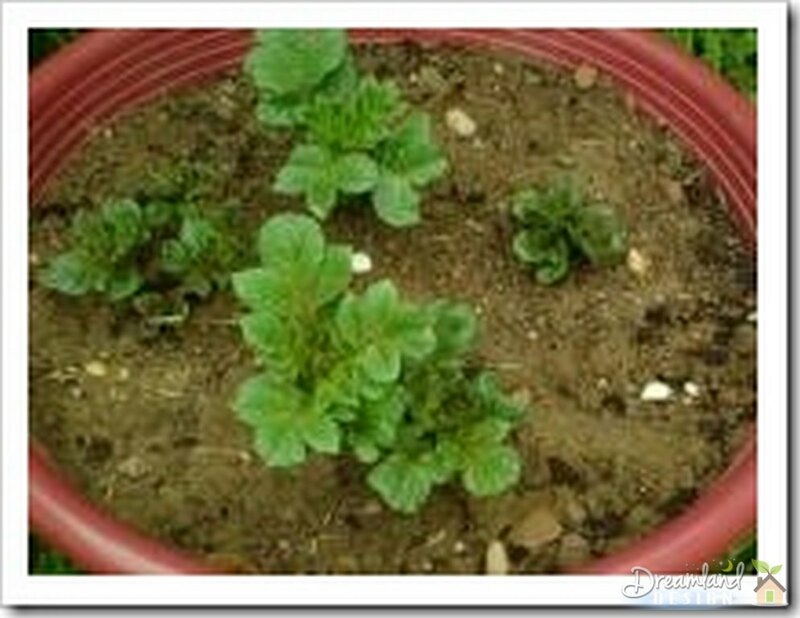 We even grown potatoes in containers. They produced some great early season potatoes that were so tasty. This container was about a foot and a half wide and we had three containers for our potato crop. However, our first container garden was for tomatoes. Containers can be pretty much anything that can hold some dirt. Of course if your vegetable requires lots of roots you may need to use a bigger container like I did for our tomatoes but for crops like lettuce or radishes I use anything. I’ve even used a pair of my son’s size 13 work boots. 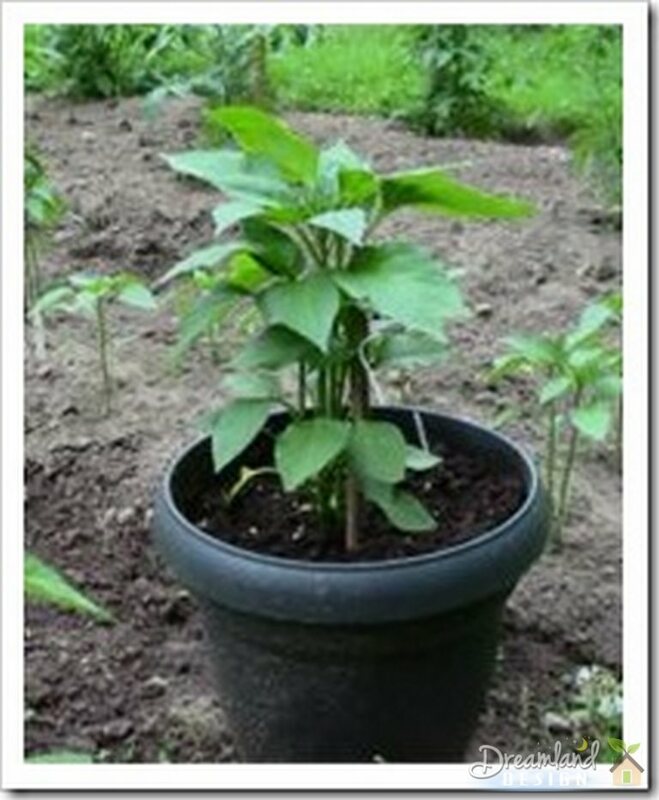 Growing pepper plants doesn’t require a huge container either. I have a couple of containers that are just a foot across and they a foot deep. It seems to work just fine as you can see from the image below. I use a cane from some of the rose bushes we cut back early this spring as stakes to kept them straight so they can grow sturdy. Currently I have these containers with the in-ground vegetable garden so I can easily water them when I water the garden, but as soon as they start producing I’ll move them close to our backdoor for easy and quick access at dinner time. 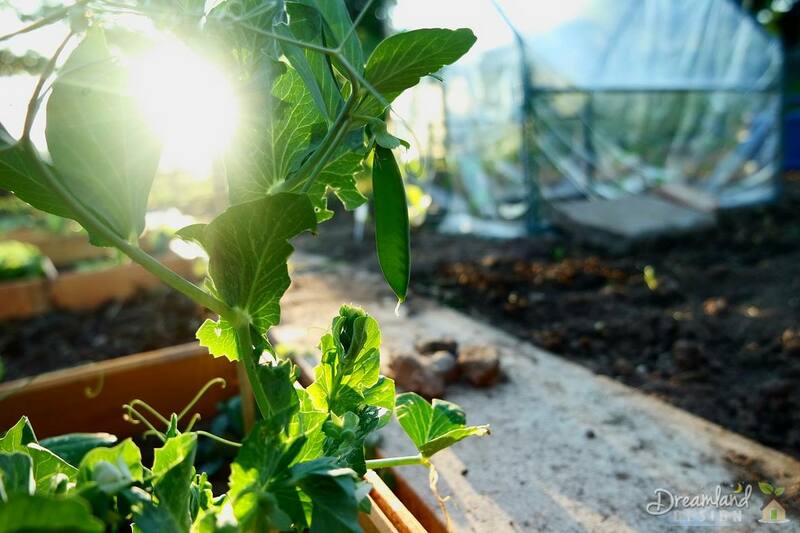 We went for many years with limited space for growing anything so container gardening was the way we went which allowed us to experience the joy of home gardening. 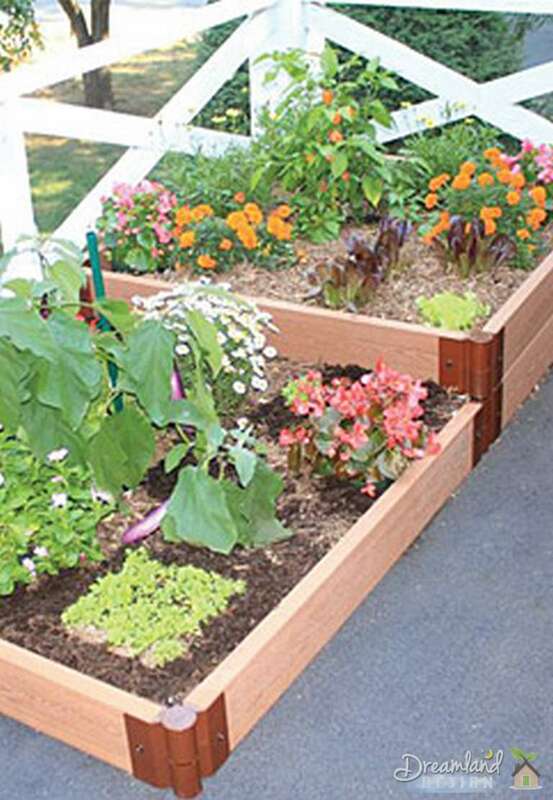 We love the idea of square foot gardening both in our in-ground vegetable garden as well as in raised beds. 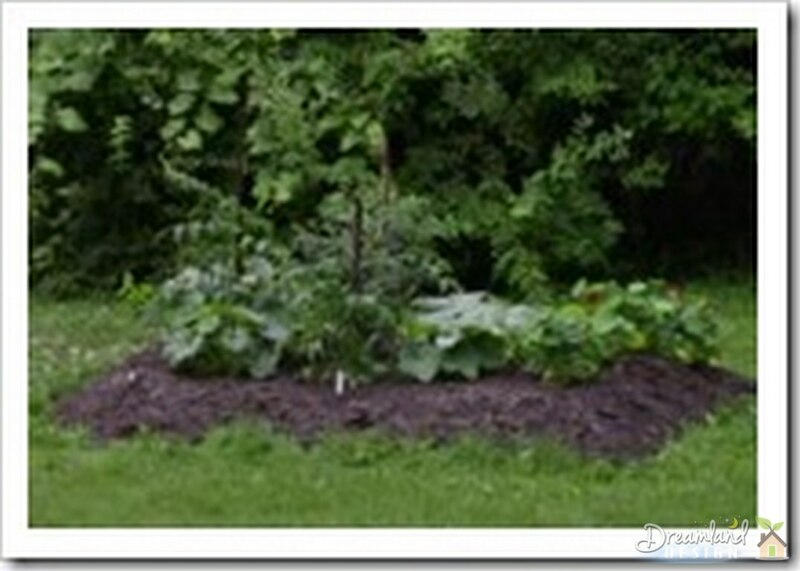 The image above shows a new square foot garden I created this year. I created it last minute and didn’t take the time to make it a raised be but I will do that come fall when I have a little extra time. If we had waited until we owned a home with a yard we would have missed out on few years of great gardening experiences and the tasty fresh and healthy produce. Don’t put it off just because of limited space. I actually started my first gardening experience on a balcony on the 11th floor apartment I lived in when I was just 20.